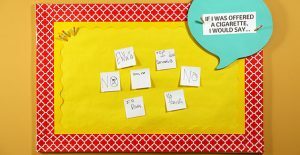 Want an easy way to talk to your students about the dangers of smoking? Here’s a fun classroom activity to get you started! It’s simple—pin weekly questions onto your bulletin board, and pass out sticky notes for your students to jot down their answers. They’ll have fun seeing what each other writes. As the weeks go on, the questions will progress, and lead into a healthy discussion about staying tobacco free. Introduce video as a part of or after Activity 3: Tobacco – Using It Is Unhealthy! See page 13 of Overview Booklet from the RDRN curriculum for a step-by-step review of the decision-making process. Review “How to Say No” poster for overview of refusal skills. Gabby (Main Character): Elissa’s younger sister. Confronted with peer pressure from her older sister to try a cigarette. Elissa: Gabby’s older sister. Tries to pressure Gabby and Zoe into trying a cigarette. Zoe: Gabby’s best friend. Influenced by others around her. Wants to fit in. The story takes place at Gabby and Elissa’s house during the summer. Gabby and Zoe are casually talking about going back to school because they are bored when Elissa pulls something from her bag and asks the girls to follow her to the side of the house. She tries to pressure Gabby and Zoe into trying a cigarette by telling them that the coolest girl in their class smokes. Zoe seems reluctantly willing to try a cigarette … just one … but Gabby does not want to. How do you think Gabby feels having her older sister try to pressure her and Zoe into trying a cigarette? What are Gabby’s choices in this scenario? What about Zoe’s choices? Are they the same or different? What are the possible health consequences for Gabby and Zoe if they try a cigarette? What do you think is the right decision to make? Gabby must decide if she is going to give in to peer pressure from her older sister or resist the peer pressure and say no to tobacco. Gabby walks through the decision-making steps by discussing the peer pressure she is experiencing from her older sister, her desire not to try smoking, the options she has to consider, the health consequences of smoking and the decision she has made to say no to her sister and no to tobacco. Gabby makes a decision to Be Tobacco Free and say no to the peer pressure from her sister to try a cigarette by assessing the risks and talking about the consequences of tobacco use. Gabby knows that you do not have to smoke to “be cool.” Zoe is influenced by Gabby’s refusal and also says no to Elissa’s offer to try a cigarette. What are the 6 steps that Gabby used to come to a decision? Call on students to offer an example of each of the decision-making steps Gabby took in this scenario. Why did she need to make a decision? What did she think could happen? Display the “How to Say No” poster from the RDRN curriculum and ask the students what refusal skill Gabby demonstrated in the segment. What reasons did she give for resisting peer pressure during the decision-making process? What are some other ways she could have said no to Elissa? Do you think Gabby’s decision influenced Zoe’s response to Elissa? Introduce video as a part of or after Activity 5: What Would You Do? The story takes place at a school playground where kids are performing dangerous tricks on their skateboards. Older kids Andy and Nate are bullying Benjamin as he thinks about trying out his new skateboard. The older boys grab his skateboard and tease him about not having the courage to try any of the skateboard tricks. He just received his new skateboard and is trying to learn some tricks, but is still a beginner and does not have the skills to attempt the more advanced, dangerous tricks. What is the dilemma that Benjamin is facing in this scenario? What do you think Benjamin is feeling or thinking at this moment as he is being pressured by two older kids? What options do you think Benjamin has in dealing with this situation? How would you deal with the situation? What decision would you make? Benjamin must decide if he is going to give in to peer pressure and attempt a skateboarding trick that may hurt him, or resist the pressure from the bullies. Benjamin reviews the decision-making steps by discussing his desire to ease into tricks on the new board, the consequences of being pressured into doing something he is not ready to try, and how he will deal with the bullying through humor. Benjamin makes the decision not to give into the pressure from the bullies and perform a trick that he is not skilled enough to accomplish. He walks through the possible options and assesses the consequences of performing a trick and decides that the pain it could cause is not worth the risk. Benjamin uses a little humor to get out of the situation and ends up using a trick to “split” from the bullies. What are the 6 steps that Benjamin took to come to a decision? What refusal skills did Benjamin demonstrate in the segment and what reasons did he give for resisting peer pressure? Why do you think he used a second refusal skill? How would you have handled the situation using one of the other refusal skills? What do you think could have happened if Benjamin gave in to the pressure from the bullies? Zoe (Main Character): Student. Facing internal pressure to cheat on a test because she is not prepared for it. Miss Randolph: Zoe’s social studies teacher. Benjamin: Classmate. Comments on how easy the test will be. The scenario takes place on a Monday during Miss Randolph’s social studies class. The class is about to begin when Miss Randolph announces the start of a big test. Zoe was out for a few days the previous week and did not know about the test so she did not study. She is considering cheating so she passes the test and does not risk failing the class. How do you think Zoe felt when she learned there was a social studies quiz she did not study for because Miss Randolph mentioned it on one of the days she missed school because she was sick? Do you think Benjamin’s comment about the test being easy has an influence on Zoe’s decision? What internal pressure do you think Zoe is experiencing in this situation? What choices do you think Zoe has in this scenario? Zoe does not want to flunk the social studies test and look stupid in front of the whole class so she must decide if she is going to guess the answers, cheat off of Benjamin or ask Miss Randolph for help. Zoe reviews the decision-making process by discussing her options, the consequences of her cheating on a test (i.e., suspension), and how she will deal with the situation. Zoe makes the decision to ask Miss Randolph if she can take the test later since she was unaware of the test because she was out sick. She took the chance of asking the teacher for an extension even though Miss Randolph could have declined her offer in front of the whole class. The risk of not passing the test or of getting caught cheating was higher than the embarrassment of being declined. What are the 6 steps that Zoe took to come to a decision? How do you think Zoe would have felt if she decided to cheat on the test? What could have happened if she did cheat? What consequences would you experience if you chose to cheat on a test? What are some other ways Zoe could have handled the situation? How would you have handled it? Introduce video as a part of or after Activity 10: It’s Decision Time! Paul (Main Character): Jay’s friend. Experiencing peer influence as he is conflicted about going with Jay on the camping trip and meeting up with the popular girl he likes. Jay: Paul’s loyal friend. Celebrating his birthday with his annual camping trip with Paul. Angela: The popular girl Paul likes. The story takes place in Paul’s bedroom. Paul chats online with Angela. She invites Paul to go hang out at the mall or her house with all the cool kids. He does not want to miss out on his chance to hang out with the cool kids, but has made plans to go camping with his best friend, Jay, who is celebrating his birthday. What is the dilemma that Paul is facing? Do you think Paul should tell Jay about the invitation from Angela? How could Paul’s decision affect his friendship with Jay? What do you think is the right decision for Paul to make? Paul is excited that Angela has taken notice of him and invited him to hang out with her and the cool kids, but his best friend is counting on him to go on the camping trip. Jay had another friend that had to cancel his trip, leaving Paul as the sole person to go. Paul reviews the decision-making process by discussing how he wants to spend time with both Angela and Jay, how Jay has always been there for him but this might be his only chance to hang out with the cool kids and how he will deal with the situation by honoring his friendship and walking away from Angela to celebrate his friend’s birthday. Paul chose to walk away from Angela’s invitation to hang out at the mall in order to go on the annual camping trip with Jay to celebrate his friend’s birthday. He really likes Angela and was disappointed not to be able to hang out with her, especially since he did not know she liked him. Paul decided to stick by his best friend and hopes that Angela will invite him to hang out another time. What were the choices that Paul considered in his decision-making process? What would you do if you were in Paul’s position? What values would influence your decision? Are you ever faced with situations where you need to make a decision between something you want to do and a commitment that you need to keep? Explain the situation and how you handled it. Introduce video as a part of or after Activity 4: Peer Pressure and Influence – Do Your Friends Affect Your Decisions? Jay (Main Character): Boy who wants to be part of the popular group. Faced with peer pressure from the popular guys to go egg homes. Andy & Nate: Popular guys at school. Want Jay to go eggin’ houses with them. The situation occurs at Jay’s house. Andy and Nate show up at Jay’s house dressed in dark clothing to invite Jay to go with them to egg houses. Nate thinks it is a bad idea because he thinks Jay is a dork. While Andy and Nate are the coolest guys in school and Jay wants them to like him, he doesn’t want to egg houses. How do you think Jay felt to have the cool kids show up at his door and invite him to go eggin’ with them? Do you believe that Andy’s comment about Jay will affect his decision? Do you think Jay is experiencing peer pressure or peer influence? Explain the difference. What are Jay’s choices in dealing with Andy and Nate? Jay is excited that the cool guys have invited him to hang out with them, especially since he didn’t think they even knew his name. Now he needs to decide if he wants to participate in destructive behavior to hang out with Andy and Nate or to respect others’ property and say no to the chance he has to be around the popular kids. Jay reviews the decision-making steps by discussing his desire to be liked by Andy and Nate, the consequences that his actions could have on his neighbors, his discomfort at potentially disappointing his parents and how he will refuse the invitation through reason. Jay made the decision not to go eggin’ with Nate and Andy and chose to tell them why going eggin’ was a bad idea. He realizes that this decision might lead to him being teased by the cool kids, but chose to stick to his values instead of going along with the crowd. What do you think would be the consequences if Jay went along and they were caught eggin’? What refusal skill did Jay adopt to demonstrate that he does not want to vandalize any property? Provide examples of other refusal skills he could have used in this scenario. How would you feel if a group you wanted to be a part of showed up at your door to invite you to hang out? How would you handle the situation if they asked you to do something that you were not comfortable doing? Do you have a core set of values that directs your actions? What are some of the values? What values do you look for in a friend? Shelley (Main Character): Jenny’s younger sister. Confronted with peer pressure as she catches her sister and her sister’s friend with cigarettes. Jenny: Shelley’s older sister. Pleads with Shelley not to tell their parents she smokes. Marla: Jenny’s friend. Brings cigarettes to her friend’s house. The story takes place in Jenny’s bedroom. Jenny and Marla are hanging out in Jenny’s room when they take out a pack of cigarettes to smoke just as Shelley walks in. Shelley confronts Jenny about her smoking and shares with her some of the health consequences of smoking. She threatens to tell their parents if Jenny does not quit. What is the conflict that Shelley is experiencing in this situation? What is the decision that Shelley will have to make? What are Shelley’s choices? Describe some of the health risks and consequences related to using tobacco. What do you think is the right decision for Shelley to make? Shelley is struggling whether to tell her parents that she caught Jenny and Marla with cigarettes or to give Jenny the opportunity to make the right choice. Shelley reviews the decision-making steps by discussing her desire for her sister to quit smoking, her concern for her sister’s health, not wanting to get her sister in trouble, the health consequences of smoking and whether she should tell her parents that Jenny smokes. Shelley chooses to reverse the pressure on her sister Jenny by threatening to tell their parents that she smokes unless Jenny agrees to quit. She is conflicted with this choice but believes that what Jenny is doing is wrong and bad for her. Shelley provides Jenny with the opportunity to make the right decision and say no to tobacco, but leaves the option open of telling their parents if Jenny makes the wrong choice. How do you think Shelley felt to find her older sister and Marla with cigarettes? Do you think Marla’s presence could have influenced Jenny’s or Shelley’s decisions? In what way? How would you have handled the situation, e.g., tell your parent(s), watch her flush the cigarettes down the toilet, ignore the situation? How should Shelley make sure her sister got rid of the cigarettes and kept her word not to smoke? What would you do if she did not give up cigarettes? Evan (Main Character): High school student. Dealing with a lot of internal stress and pressure due to his grades. Carla: Evan’s friend. A smoker who desires to quit. Teacher: One of the teachers at the school. This situation takes place at Evan’s locker in the school hallway. Evan gets frustrated by not being able to open his locker…and Carla laughs at him. Evan appears to be stressed about a lot of issues: math, parents, soccer practice, Felicia, locker, and a monster zit. He makes a statement to Carla about needing a cigarette, even though he does not smoke, but Carla tries to discourage him and states that she is trying to quit. When Carla walks away, her cigarettes fall out of her backpack and Evan considers picking them up. What issues are Evan dealing with in this situation? What effect do these issues seem to be having on his behavior? How do you think tobacco will affect Evan’s stress? What do you think would be the consequences of getting caught with tobacco and how would this affect Evan’s stress? Evan must decide how he is going to deal with the stress he is experiencing in his life. Evan reviews the decision-making process by thinking about trying a cigarette, the possibility of being suspended if caught on campus with a cigarette, how he might find more positive ways of coping, and how he will just walk away and leave the cigarettes. Evan is stressed about many issues in his life, but realizes that tobacco is the one thing that he does not have to worry about right now. He makes the decision not to try tobacco and to find another way to relieve the stress he has in his life. Evan takes another look at the cigarettes Carla dropped on the floor and chooses to walk away. Do you think Carla’s discouragement about trying cigarettes when she is trying to quit helped Evan to make the right decision? Provide suggestions of other activities Evan can do to relieve his stress. What can you do on an ongoing basis to keep your stress levels down? Describe some stressful situations that you have dealt with in your life. Explain what you did to alleviate the stress. Connor (Main Character): Friend of Ethan and Bobby. Confronted by peer pressure from a friend that is using smokeless tobacco. Ethan: Friend. Exhibiting signs of addiction to tobacco. Bobby: Friend. Influenced by others around him. Connor and Bobby are at Ethan’s house playing video games while Ethan’s parents are out of town. The friends are playing video games at Ethan’s house when Ethan pulls out an almost empty can of dip. He begins to look under the mattress and in the trash, pulling out empty cans until he finds a fresh can in his sock drawer. Ethan and Bobby are going to take some tobacco from the can…and they try to pressure Connor into trying some by calling him names and teasing him. How do you think Connor feels having his friends using smokeless tobacco and pressuring him to try? Display the “Look What Tobacco Can Do” poster and ask the students to give an example of the possible health consequences of Ethan and Bobby using smokeless tobacco. What causes addiction to tobacco products and how does it affect the body? What do you think is the right decision for Connor to make in this situation? Connor must decide if he is going to try the smokeless tobacco like Bobby or if he is going to take a stand and say no to tobacco. Connor reviews the decision-making steps by discussing how he has learned about addiction in school and talking about how he wants to get his friends to stop pressuring him to try dip. Connor chooses to stay tobacco free and not to give in to the peer pressure from his friends. He does not want to try smokeless tobacco and does not want to get addicted, but he also does not want to lose his friendship with Ethan and Bobby. He says no to his friends and helps to educate Ethan about the risks of smokeless tobacco and then decides to re-focus his friend’s attention on their gaming contest. How would you handle a situation where two of your friends were using tobacco and tried to pressure you into trying it? Would your decision change if they stated that they would no longer be your friend? Would tobacco use affect your decision to befriend someone? If you had a friend that used tobacco, are there things you can do to help your friend to make the right decision about saying no to tobacco and choose to be tobacco free?